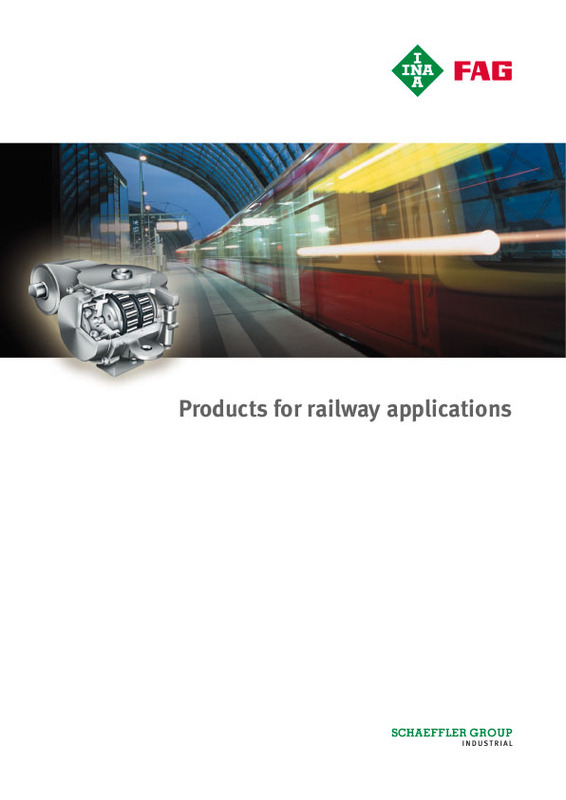 Axlebox bearings are made up of a railway housing and rolling bearing, and are safety-relevant components in rail vehicles. FAG axlebox bearing housings are made from cast material and designed according to the customer's specifications. All railway housings are calculated via FEM, stress-optimized, and designed in accordance with the specified limiting values. The rolling bearings used in axlebox bearing applications are FAG WJ/WJP cylindrical roller bearings, complete FAG cylindrical roller bearing units, and FAG TAROL tapered roller bearing units. TAROL and FAG cylindrical roller bearing units are ready-to-install units that are greased and sealed at the factory. 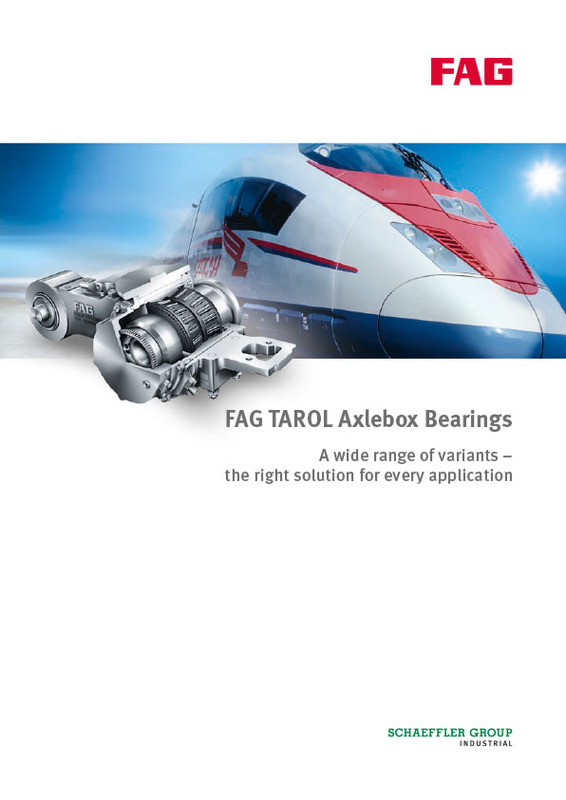 FAG TAROL S tapered roller bearings in X-life quality with integrated seals provide a low frictional torque and are particularly suitable for long periods of operation. 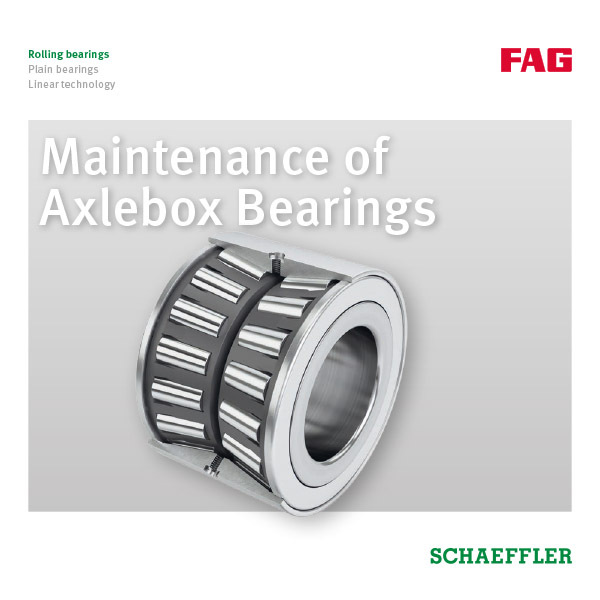 All FAG axlebox bearings are designed for high mileages and long maintenance intervals. The lubrication and seals are dependent on the application and the actual climatic conditions. 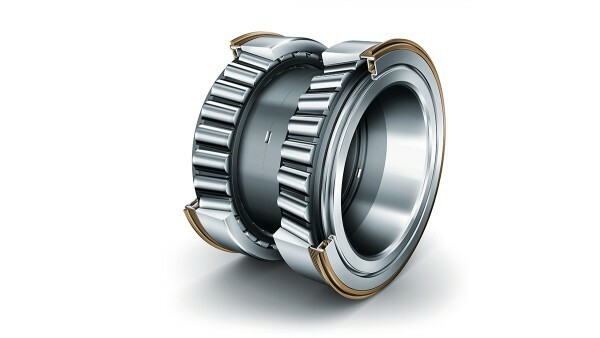 The bearings are manufactured according to the specifications of EN12080. A performance test in accordance with EN12082 is carried out to ensure that the axlebox bearing is suitable for its intended application. The product range is supplemented by mechatronic components for condition monitoring. 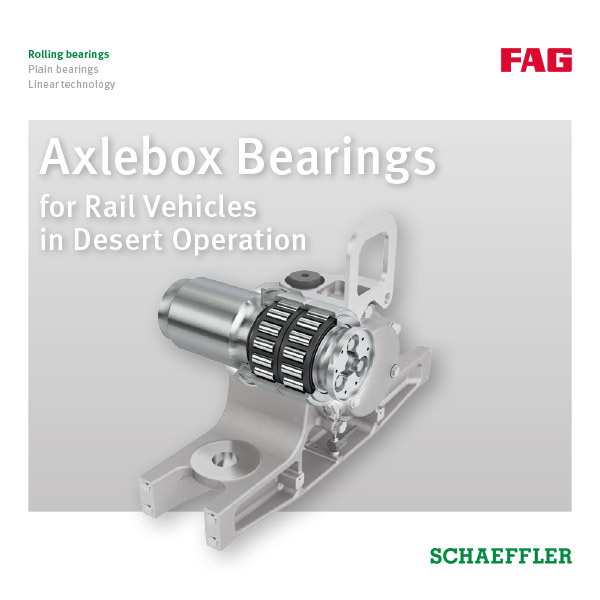 Axlebox bearings for locomotives are characterized by their particularly high load ratings. 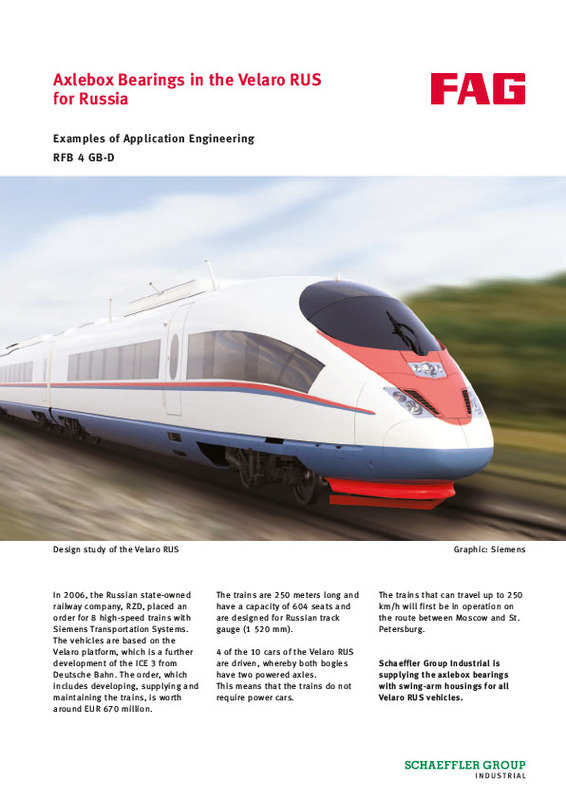 For safety reasons, the bearings used in high-speed transportation applications are manufactured from steel that is subject to specific requirements with regard to the purity of the material. 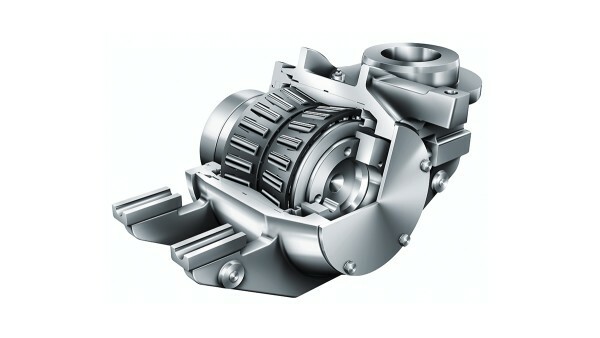 These bearings are equipped with non-contact seals to allow them to be operated at low temperatures, and special high-speed grease is also used. Trains used in local passenger transport have to brake every few minutes, which poses a particular challenge for the lubricating grease. Contrastingly, the bearings used in long-distance passenger transport are designed for higher speeds. The low-floor design of some streetcars means that bogies cannot be used, so low-floor axles with individual bearing supports are used instead. The low-floor design of some streetcars means that bogies cannot be used, so low-floor axles with individual bearing supports are used instead. FAG insert hub units have proven themselves in numerous applications. The FAG tapered rolling bearing pair is set at the factory in such a way that the bearing support is clearance-free after mounting and has good running characteristics, a long operating life, and long maintenance intervals.